When children come along, the backyard becomes less of a relaxing haven and more of a play area for ballgames, fort-making and even cycling. However, you don’t have to let your natural paradise be overrun by plastic toys and climbing structures. Here are some clever ideas to transform your garden into a kids’ wonderland that grown-ups will enjoy too. There’s often no need to buy specific items for kids to play with. Use your imagination and create simple play areas out of natural materials, such as these tree stumps, which would make a great obstacle course or seating area. Alternatively, place steppingstones across a lawn, and either leave them plain or paint and decorate them. When you’re chopping or pruning in the garden, don’t throw out the waste immediately. Leave it in a pile for your children to enjoy, or challenge them to make something amazing with it. 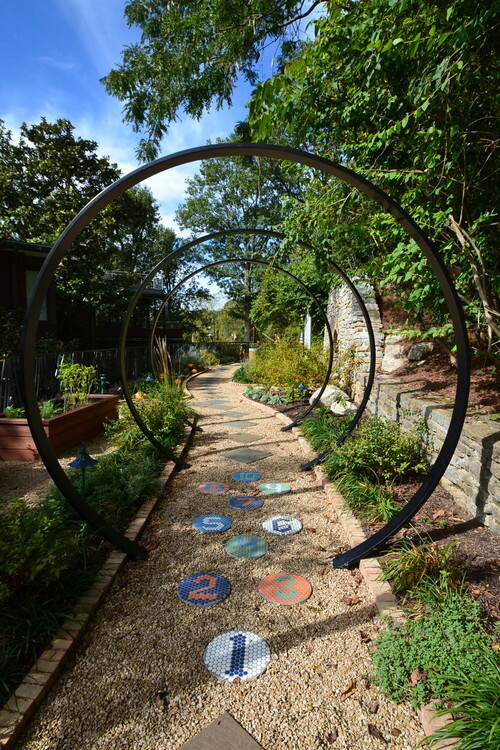 If you’re redesigning the hardscape, it’s worth incorporating your children’s ideas into the design. Here, a stainless steel slide was included in the step construction, with a simple sand pit at the bottom. 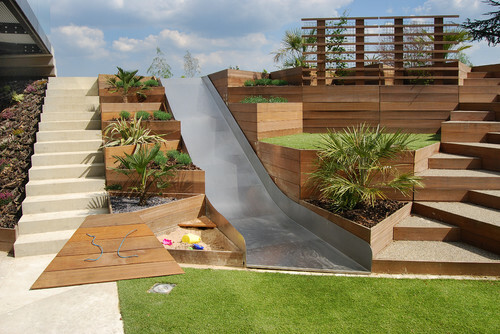 The result is a stylish garden that looks good and keeps the kids happy at the same time. You can’t beat a lawn for playing on. It provides a soft landing for practicing cartwheels and handstands, a pitch for ballgames or just a place to sprawl. 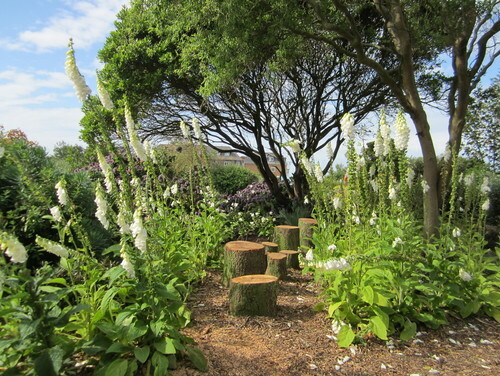 In the surrounding flower borders, choose easy-maintenance plants and shrubs that will stand up to balls and trampling. Encourage your children to enjoy the garden by stimulating all their senses. For sight, grow bright flowers, such as marigolds, nasturtiums and sunflowers, or Swiss chard for its multicolored stems. Rustling grasses and rattling seed heads are lovely to listen to in a rare quiet moment, while a variety of textures, such as the downy leaves of sage, will persuade little ones to use their sense of touch. Include fun smells, such as the curry plant or chocolate cosmos, and stimulate the taste buds by growing easy herbs, such as chives and mint, or a pot of juicy strawberries. When is a swing not a swing? When it’s a beautiful wooden swing seat. If your kids like to sway, but you don’t have space for a proper frame, a wooden rocker like this would be the perfect option. Similarly, a fabric hammock tied between two posts, or attached to a portable stand, is a fabulous source of fun. Nothing keeps children more entertained than bouncing up and down for hours. There are some great trampolines on the market in a range of sizes, but they do take up a lot of space. For something less overpowering, a sunken trampoline is a fantastic option. You can either buy a do-it-yourself kit or get a professional to install it for you. As well as looking lovely, an embedded trampoline is less likely to blow over, and children won’t fall off it. A completely open space can get too hot on a long summer day, so make sure you create some shade to which children can retreat. 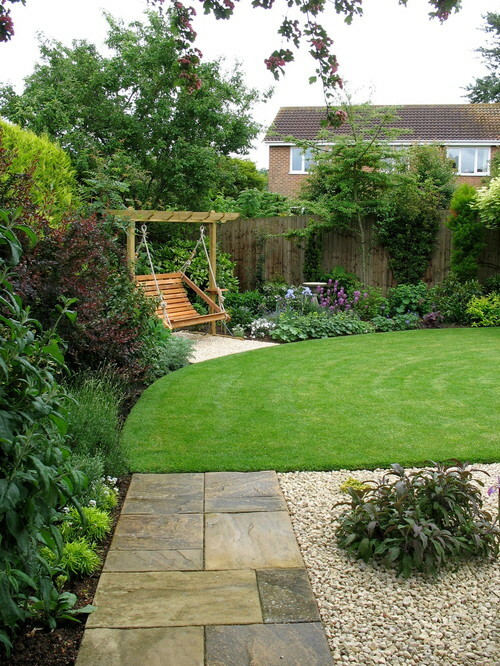 Trees are a great option; alternatively, erect a canopy, pergola or simple umbrella. Encourage your kids to stay out of the sun by putting a play table, sand pit or swing in this shaded spot. On a rainy day, a covered area will also give them the opportunity to get outside in the fresh air. Children love forts and other hideouts, which can be as simple as a shaded corner or as grand as a treehouse. 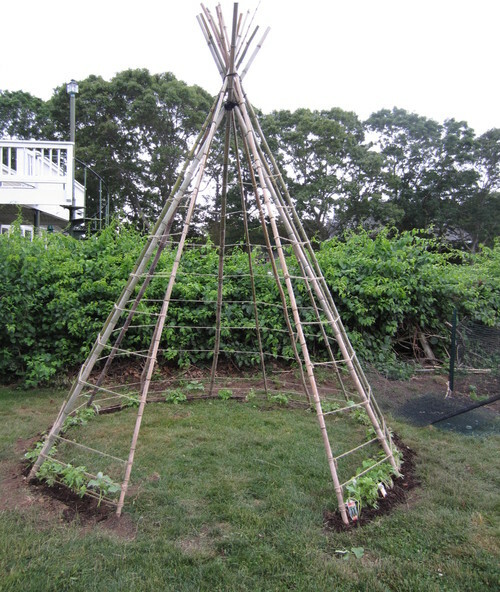 A bean tepee like this is a simple idea that provides both a camp for the kids and a beautiful support for beans. Buy some willow or bamboo canes from your local garden center and construct a circle, held in place with garden twine. Plant beans at the base and train them to grow up the frame. Mosaic tiles are easy to buy from craft suppliers and are a lovely way to brighten up the garden. Choose a grout that’s waterproof and ensure that there are no sharp edges. Then let your imagination run wild. 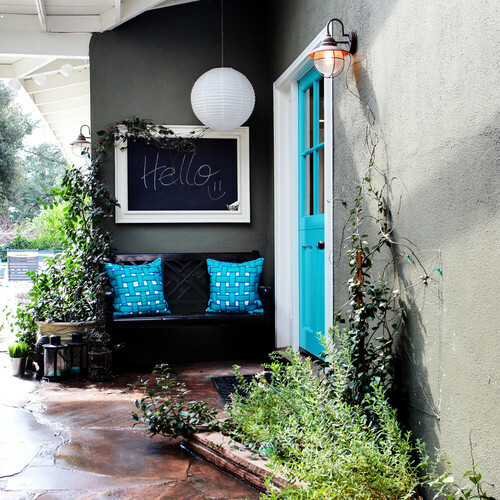 You can create large designs on walls and patios, or go for something smaller. The numbered steppingstones along this path would be simple to make, but they look fun and will provide the basis for a whole host of games. Haven’t got the space for a large piece of equipment? Create your own instead with a pack of climbing wall holds. Make sure you choose a very sturdy wall, then simply screw the holds in at various points. For safety, it’s best to get an expert to do this, as it’s important they’re extremely secure. Got a spare wall you don’t know how to decorate? Transform it into an art station by adding a coat of blackboard paint. If your wall isn’t flat, you’ll need to clad it with some exterior plywood and add a sealant along the edges. Alternatively, hang a framed blackboard, as these homeowners have done. The seat below provides a kneeling spot for little ones to reach their art board above. With kids comes clutter, so build easy-access storage areas to hide it and keep it out of the rain. 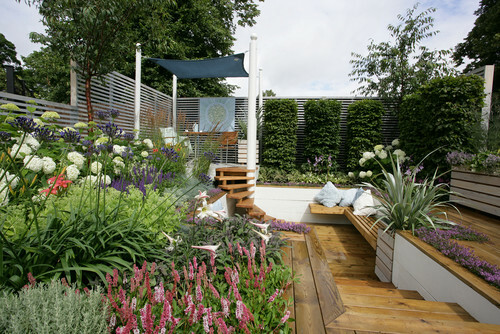 You could add space under your deck, or choose garden-seat storage or purpose-built containers. 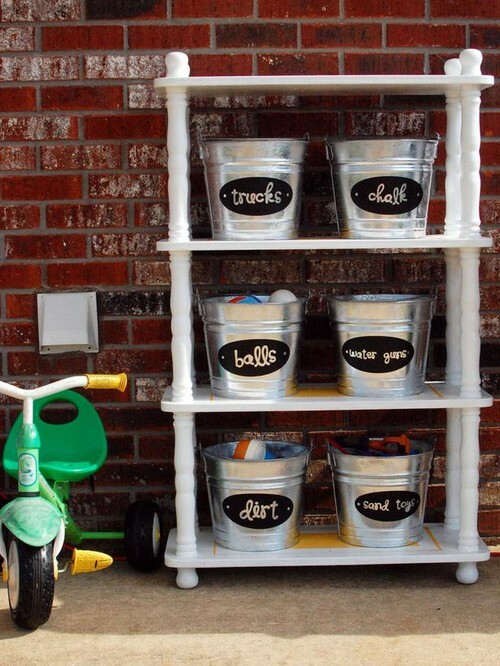 These labeled bins are a simple solution that should encourage little ones to tidy up after themselves.